Perfect trek for nature lovers. Let us introduce you to our breathtaking seven hour trek past Berber hamlets and 2 mountain passes, with the splendid Jbel Oukaïmeden in sight. The route is super exciting and circular, taking in as much scenery and natural beauty as is possible in 1 day. The trek begins by heading east from Imlil (1,740m) along the Tamatert Valley before turning north through the pass named Tizi n’Tamatert (2,279m) and down via the Berber village of Tinerhourhine into the Imenane valley. This valley is then followed to the north, along winding mule trails through fragrant walnut and apple groves and terraced Berber hamlets to the villages of Ikiss and up to Amssakrou. In this delicious place we will have a picnic where lunch will be taken. Super news: you’ll have a superb view of the peak of Jbel Oukaïmeden (3,268m) and the 2 passes, Tizi n’Ou Arg (2,258m) and Tizi n’Tiratene (2,268m). The return is equally exciting! It is in a westerly direction via the pass, Tizi n’Aguerssiouâl, then through the Assif n’ Aït Mizane Valley and back to Imlil. Next the walk continues along mule trails and past escarpments through the Tizi n’Aguerssiouâl Pass (1,767m) and on to the village of Aguerssiouâl in the Assif n’ Aït Mizane Valley (2,664m). We will then head south back up the valley towards the peaks of Jbel Toubkal, Aguelzim and Aksouâl to the villages of Taddart and Aït Souka where the walk heads east back in Imlil. The perfect trek for those who can’t get enough of mountains! An 8 hour trek west of Imlil past Berber hamlets with a stunning mountain panorama including the Jbel Oukaïmeden range. We will arrive to a waterfall where a refreshing swim may be possible. The waterfalls are by juniper and pine forest and a transhumance village, inhabited by shepherds in summer. The further walk heads west from Imlil (1,740m) up through the sweet almond, walnut and apple groves offering a panoramic vista of the beautiful valley and Berber hamlets of Tanghourt, Fimlil and of M’Zik. There is a strenuous ascent to the pass, the Tizi M’Zik (2,664m) from where there is a splendid view of the Jbel Oukaïmeden range, the plateau of Tazaghârt and of the pretty Assif Aït n’Ouissedene lined with palms. Next the walk descends through juniper and pine woods between Jbel Tasghimout (2,664m) and Adrar Adj (3,729m) to the Tamsoult Cascade (2,204m). It’s a lovely spot for a picnic lunch and from late spring to early autumn, a lovely place to bathe. 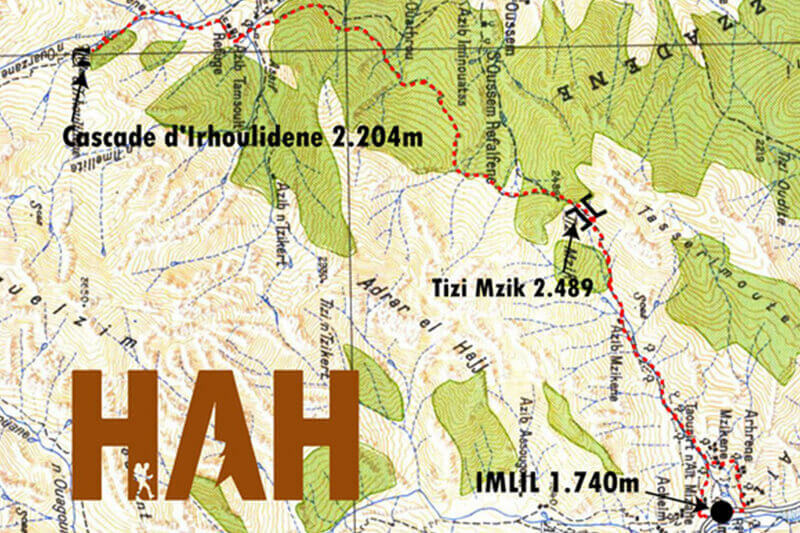 The return leg is via the same general route but by different paths via the Tizi M’Zik back to Imlil. The change of the paths will give you new, interesting views to admire. This is a relatively gentle trek of about 4 hours. Perfect for less experienced hikers and people who look for something easy yet exciting. It features some fascinating Berber villages, views of irrigated terraced fields, a pilgrimage site perched in the mountains, and excellent views of the major peaks in the Toubkal National Park. The trek takes a route south from Imlil (1,740m) to the hamlet of Achaine and on to the Berber village of Aroumd (1,843m), passing via almond and walnut groves and numerous hamlets perched on the slopes en route and offering superb views of Jbel Toubkal and the adjacent peaks. It’s time to discover another exciting part of this region! There are two of the most interesting settlements: first one is Aroumd - a village built on a large glacial morainic spur overlooking ancient irrigated terraced fields. The second one is the pretty village of Sidi Chamharouch (2,310m) - a Berber village with a waterfall and a marabout shrine visited by devout Muslims. Picnic lunch will be served at a beautiful viewpoint where Jbel Toubkal and the neighbouring peaks are clearly visible.